Empowerment Series: Social Work and Social Welfare 8 Edition Integrating the latest accreditation standards and practices from the field, the eighth edition of bestselling SOCIAL WORK AND SOCIAL WELFARE gives readers a solid understanding of the social work profession and the role the profession plays in the social welfare system. 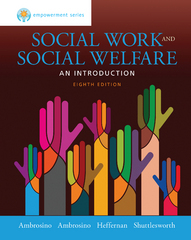 In keeping with the current Council on Social Work Education's Educational Policy and Accreditation Standards, the book presents a generalist practice perspective in addressing social welfare issues within the context of the systems/ecological framework, the overarching framework used by generalist practitioners as they intervene to address social welfare needs at the individual, family, group, organization, community, and societal levels. Illustrating that there are many reasons why social problems occur, the book explores the history, values, and economic, political and cultural factors that surround these issues, as well as the attempts to solve or address them. Completely current, the eighth edition also includes updates on such key issues as health care, mental health, immigration, and criminal justice.